Sydney Lerman, of Westchester, NY, is a smart, fun-loving, and spirited daughter, sister, cousin, and friend. However, the 14-year-old was diagnosed with Marfan syndrome at birth and has faced challenge after challenge punctuated by multiple cardiac and orthopedic surgeries since she was five months old. There were the five months she was in the hospital starting when she was four months old. Then, when Sydney was two, the family attended the Foundation’s annual conference in St. Louis, where Sydney went into heart failure and required a heart transplant. The family packed for the weekend and ended up staying in St. Louis for three months. Since then, there have been seven back surgeries, which required various lengths of hospital stays – either in New York City, near their home, or in Baltimore. Sydney’s mom, Barbara, remembers clearly what got them through these difficult times. It was the support from her family, friends, and community. The same thing happened during Sydney’s hospital stays for her spine surgeries. 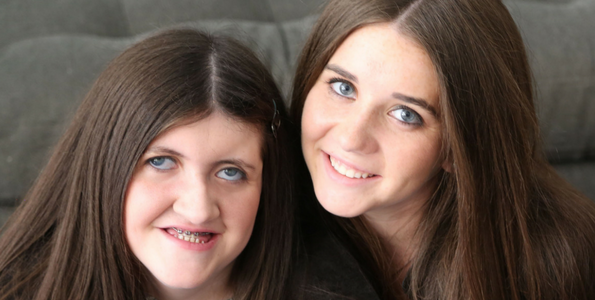 Whether they were at Columbia Presbyterian or at Johns Hopkins, the Lerman family received an unbelievable number of packages for both Sydney and her older sister, Carly, who does not have Marfan. As Sydney neared her 13th birthday and her Bat Mitzvah, the family brainstormed ways Sydney could give back as part of her mitzvah project and came up with the idea of sending care packages to kids with Marfan syndrome and related disorders who are in the hospital. They raised $32,000 by reaching out to their friends and family, but they want to do more. That’s when the Sydney Lerman Pediatric Hospitality Program was born. Through this initiative, created by Sydney and Carly, kids who are in the hospital (and their parents) can complete a questionnaire to find out what the hospitalized child and family likes. There will be standard gifts for every family – like iTunes gift cards, small electronics, and local restaurant gift cards – as well as customized gifts based on the preferences expressed in the questionnaire. The goal is to provide small gifts – such as coloring books, stuffed animals, and puzzles – throughout the hospital stay as well as a larger gift – such as tickets to a Broadway show – upon discharge. A support network can make all the difference when a family is trying to keep a positive outlook during a hospital stay. 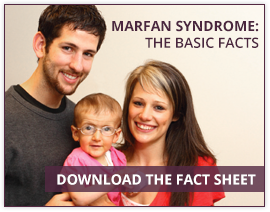 Sydney and Carly want to let families know that they are not alone and, even if they don’t have a support network, the Marfan family is there for them. But the girls can’t do it alone. Please help this effort to help families around the country while their children are in the hospital. Donate to the Sydney Lerman Pediatric Hospitality Program today. Any donation, small or large, is appreciated. To learn more about the program, and to participate if your child is going to be hospitalized, read more on our website.